What’s behind growing push to punish dealers in fatal ODs? Faced with an alarming increase in opioid addiction, a growing number of prosecutors are charging dealers not just for selling but for the deaths of customers who overdose on heroin or fentanyl. Here are some questions and answers about opioid abuse and this approach to pursuing dealers. HOW MANY AMERICANS DIE OF OPIOID OVERDOSES? 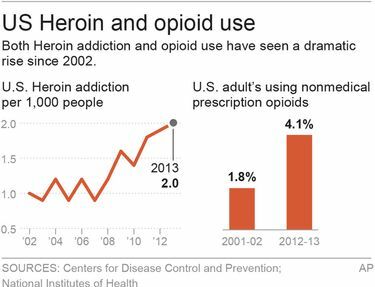 There were 28,647 opioid overdose deaths in 2014, including heroin, according to the U.S. Centers for Disease Control and Prevention. That represented 61 percent of all fatal drug overdoses that year: 47,055, the highest annual total on record. The fatalities include those from abused prescription opioids such as Oxycontin. Deaths involving heroin nearly tripled from 2010 to 2014 — from 3,036 to 10,574, a faster pace than other illegal drugs, according to a 2016 Drug Enforcement Administration report. It also said the heroin threat is especially high in the Northeast and Midwest. A 2015 DEA study said fatal drug overdoses are the leading cause of injury deaths in the U.S., ahead of deaths from motor vehicle accidents and gunshots. FENTANYL IS OFTEN MENTIONED IN TODAY’S EPIDEMIC. WHAT IS FENTANYL? Fentanyl is a synthetic opioid up to 50 times more powerful than heroin. The painkiller is often prescribed for advanced cancer patients, but it’s also illegally manufactured in clandestine labs, frequently in Mexico. Fentanyl caused more than 700 deaths in the U.S. between late 2013 and early 2015, according to the DEA. Heroin or other drugs are sometimes laced with fentanyl; sometimes fentanyl is sold as heroin, unknown to the user. The CDC says that more than 80 percent of the fentanyl seizures in 2014 occurred in 10 states: Ohio, Massachusetts, Pennsylvania, Maryland, New Jersey, Kentucky, Virginia, Florida, New Hampshire and Indiana. HOW DOES PRESCRIPTION ABUSE FACTOR INTO THE OPIOID CRISIS? Nearly 10 million adults misused prescription opioids in 2012-2013, the National Institutes of Health reported. WHERE AND HOW ARE STATES PROSECUTING DRUG DEALERS FOR FATAL OVERDOSES? — In Summit County, Ohio, since 2013 there have been 22 involuntary manslaughter convictions in heroin or fentanyl deaths. All of those charged pleaded guilty except Kevin Ecker, who was convicted at trial and sentenced in July to 21 years in prison for a variety of drug-related charges, including causing the fentanyl-related death of a 21-year-old woman. — In Charleston, West Virginia, Steven Craig Coleman initially faced a murder charge in the overdose death of a mother of three but agreed to plead guilty to involuntary manslaughter and attempting to distribute heroin. He was sentenced in July to one-to-three years in prison with another year in jail. Coleman apologized, identifying himself as an addict who needs help. — In Portland, Maine, Adam Norton was sentenced in July to five years in federal prison for providing heroin to a man who died. Days after the overdose, authorities said, Norton sold heroin to one of the man’s family members, who also overdosed, but was revived with the antidote, Narcan. In sentencing, the judge noted that Norton’s drug dealing was linked to his own heroin addiction, which started with prescription painkillers. WHAT IS PROSECUTORS’ VIEW OF THIS ENFORCEMENT APPROACH? Charging dealers with involuntary manslaughter sends a clear message that they must be held accountable, says Margaret Scott, deputy chief assistant prosecutor in Summit County, Ohio. “These dealers are well aware of the heroin epidemic in the community, and the drugs they’re providing are killing people.” she says. The prosecutions came as a result of the formation of a county opiate drug task force in 2012 to deal with the growing heroin crisis. HOW DO DEFENSE LAWYERS RESPOND? Prosecuting dealers is a bad idea because in most cases, they’re small-timers trying to finance their own addictions, says Robin Shellow, a defense lawyer in Milwaukee. “No one wakes up in the morning and says, ‘I want to kill my friend, my friend’s friend,’ or whatever,” she says. The push to prosecute dealers — “it’s the crime du jour” — reflects the changing face of addiction, with more middle- and upper-middle-class addicts, Shellow says.